Updated several times, last time being August 29, 2015, in order to update the solar panel and solar cell efficiency record chart. One of the most common things people ask when they start to consider going solar or start to plan their life-changing solar expedition is which are the most efficient solar panels. However, first of all, that’s not even the right question for most people, and second of all, the literal answer to that question really isn’t relevant for the average consumer. Let me explain…. First of all, the important matter is not which solar panels are most efficient, but which solar panels are the best value for the money. If you’ve got space for 10 solar panels on your roof and you have an option between solar panels “ABEfficient” that are a bit more efficient but twice the price of solar panels “CDCheap,” chances are, you are going to make a much bigger savings by going with CDCheap. Of course, the important thing would be to see what’s available in your situation and simply run the numbers (or, if you are allergic to math, have a friend who can do math run the numbers for you). 46% efficient solar cells by Soitec & Fraunhofer Institute. Notably, these world-leading solar cells from Soitec and Fraunhofer Institute are in the concentrator triple-junction solar cell category. Such solar cells are complicated and are not used in residential or commercial applications… because they are bloody expensive. They are used in space applications by the likes of NASA, where a bit of extra space (or, as it may be, less space via extra efficiency) can make a huge difference. 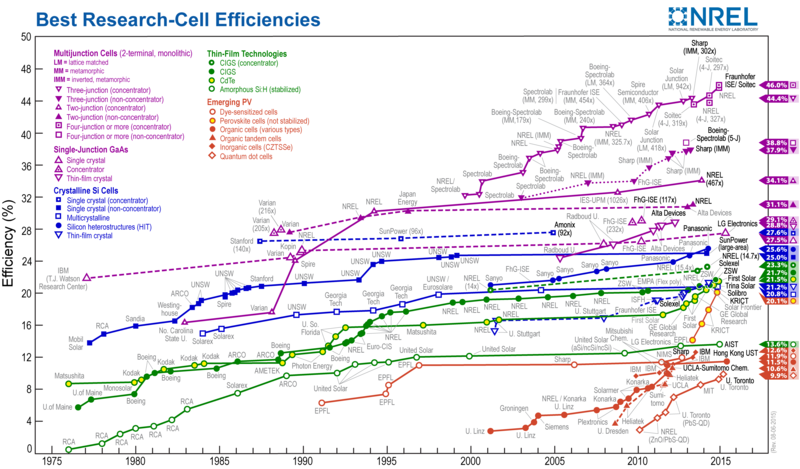 44.4% efficient solar cells by Sharp previously held the overall efficiency record. However, they still hold the record for triple-junction (concentrator) solar cells. 37.9% efficient solar cells by Sharp. A big step down, these are in the triple-junction, non-concentrator solar cell category. If this is all new to you, it might take you awhile to see the difference in the categories. The difference is that these solar cells don’t use anything to concentrate the light hitting the solar cells, while the 44.7% efficiency cells noted above do use something to concentrate the light (of course, adding to their costs). 32.6% solar cells by a Spanish solar research institute (IES) and university (UPM). These are another step down, as they are in the two-junction, concentrator solar cell category. (For an intro on “junctions,” by the way, check out this multi-junction photovoltaic cell article on Wikipedia.) Again, these are still far different solar cells from what are used in commercial or residential installations. There are about a dozen or so extra categories that I could run down. Some categories have very high efficiencies but the solar cells are quite expensive, while others are actually on the other end of the spectrum (no pun intended) and are very cheap but have very low efficiency. Of course, some are both inefficient and expensive, but apparently worth researching nonetheless. The key, as I noted earlier, is finding the best balance between cost and efficiency. Now, there’s less research on solar panels than on solar cells because the core of the technology is the solar cell, so that’s what researchers at many institutes and universities spend their time on. No one is even going to try to manufacture a solar panel that won’t sell because it isn’t made of marketable solar cells. Still, there are many different types of solar panels (more accurately known as solar modules) on the market and many, many manufacturers of some of the most common types. So let’s look at the leaders in this category. Why didn’t I start with the solar modules? Because then it would be easier to miss the point, which is that solar panel efficiency is not the metric you use to choose solar panels for you home. Levelized cost or IRR would be a better figure to focus on. 36.7% efficient Soitec and Fraunhofer solar modules hold the overall solar PV module efficiency record. However, these are made with concentrator solar cells and are not used in residential applications. This record was previously held by similar Amonix solar modules. 22.1% Panasonic solar modules hold the commercial solar module efficiency record. However, SunPower’s SPR-327NE-WHT-D modules are the leading solar modules in solar module yield field tests, and other SunPower solar modules come in #2 and #3 in those tests. Just as one final example in order to show that the variation doesn’t stop there, 15.5% solar modules from MiaSolé hold the flexible PV solar module efficiency record. Naturally, in some applications, one doesn’t just need solar panels, one needs flexiblesolar panels. But, that probably isn’t you…. Skip the focus on hypotheticals and irrelevant superlatives. Forget about what the “most efficient solar panels” are. Check on the solar installers in your area (you can get connected to them via our home page). See what they quote you. Ask them what solar panels they would use if you want to know. And compare your options to your heart’s content. Don’t go trying to find solar panels that were designed for NASA satellites.